eggplant balls! with mushroom marinara – ugly food tastes better. Just when I thought I was getting sick of eggplant, I found this recipe for asian eggplant balls and thought, I could totally Italy that up to go with the mushroom marinara I made the other night and use my CSA eggplant. Lynn had made a ton of breaded eggplant cutlets with the last one that i DID fry,(but i only ate 3 slices i swear) and made a mushroom marinara sauce to eat them with, so I had leftovers to serve these with. I had a lot going on yesterday, several people came in from out of town and there was a ridiculous fire works display out the window while I was cooking and i totally forgot to take pictures until I had already set the table for football snacking. Apologies. 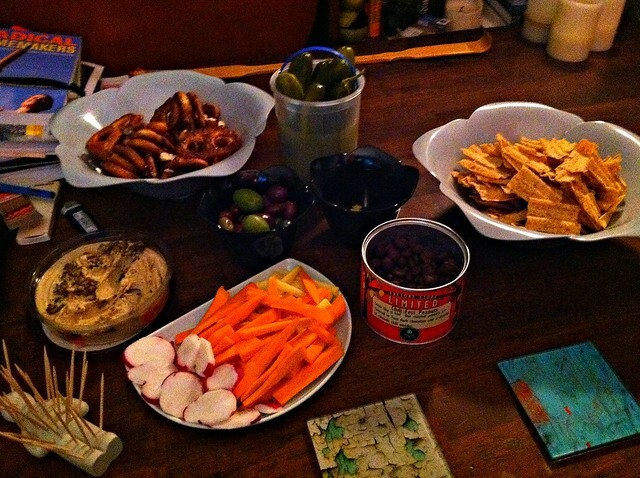 I think I put out a pretty good and healthy spread compared to the meatballs, wings, and Doritos i used to do. Still kicking myself for not taking better pictures. Pictured above…everything pretzels, horseradish pickles by Horman’s Best that are AMAZING, mixed olives, chile and chocolate covered peanuts from the chile pepper fest that ima blog about later, sun chips, olive hummus, and cut up CSA veggies, which included a super delicious yellow carrot and the best radish I have ever had. So, I am not including my marinara recipe, mostly because it is something i make all the time, and i never make it the same way twice. I assume everyone has their own favorite recipe, but maybe next time. Nutrition – I am not on the carbs-are-evil train with the rest of the crazies. Bread was good enough for the Romans, its good enough for me. This is a well balanced side dish with more veggies than breadcrumbs and little oil. Step 1 – muy importante. slice your eggplant into circles and lay across paper towels and grind sea salt across them. This will draw the water out of your eggplant. Let them sit about 10 minutes and then blot water and salt off with a paper towel I find it works much better to use sea salt rather than table salt, and this way the chunks are bigger and easier to blot off so that your eggplant isn’t too salty. Then dice your eggplant and put in a sautee pan heated with a splash of both water and good quality extra virgin olive oil and cook until tender. Reserve in a bowl to cool. 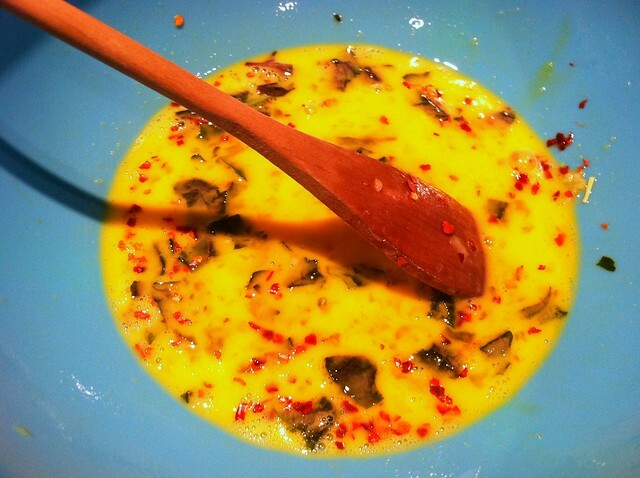 Step 2 – in a mixing bowl, crack 4 eggs and beat them! then add red pepper, garlic, basil, oregano, and cheeeeeeese. I refrained from using a whole cup because im trying to lessen the amount of dairy i am eating, since i could live on cheese. 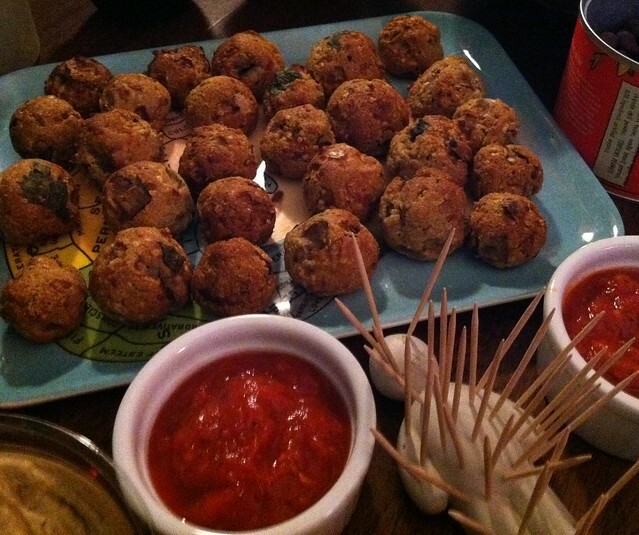 So, even though i think cheesy eggplant balls would be awesome… I am balancing my diet for my health. Step back and admire the pretty colors. 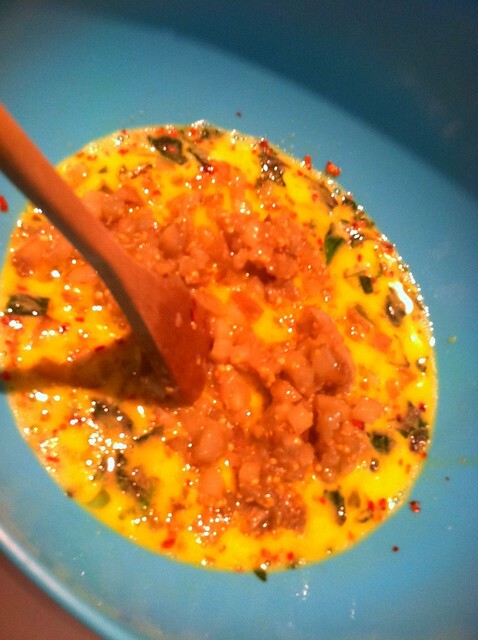 Step 4 – Add breadcrumbs and mix thoroughly with a wooden spoon. Set your oven to preheat to 400. Then spray or grease a baking pan and start rolling your mix into golf ball sized balls. The amount of eggplant makes this time consuming, but stay with it, and you should be done by the time your oven has preheated. Bake for 40 minutes and when there is 10 minutes left, put ramekins of marinara into the oven. VOILA. 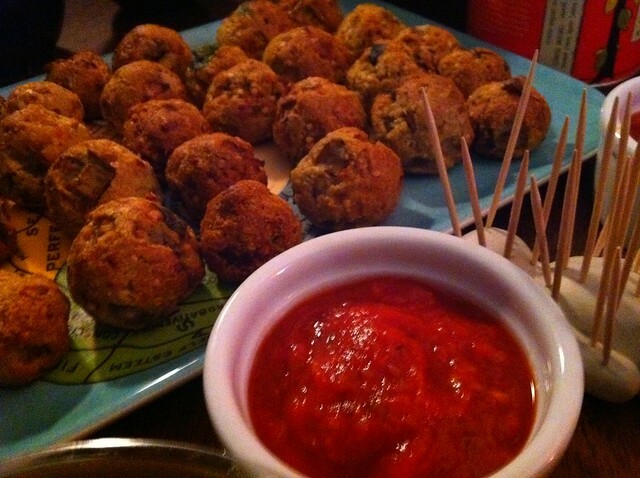 Delicious eggplant balls and warm mushroom marinara. Consensus – these are my new favorite “meatball”!!! ummmm- yum! and where was my invite!